The phone quality is pretty good. Both incoming and outgoing sound is clear. But the integration with Skype and Windows could be improved. Essentially, the USB phone is nothing more than a phone-formed headset with a keypad. I had some more expectations from a device called "phone", but what can you expect for 13 dollars? The phone is setup as a sound device in Windows, and when plugged-in to the USB port, all sound goes through the phone instead of regular speakers. This is not very good as you most probably only want the sound from Skype program go through the phone, not sound from other programs. At the same time, this "feature" makes it possible to use the phone with the most of other softphones because it takes over standard audio input/output devices. It worked fine to speak and hear with X-Lite softphone (I dialed using mouse and softphone's virtual keypad) and after I downloaded a special driver, I could even use phone's number pads to dial the number. Luckily, it's possible to manually change the settings in Windows after plugging in the phone to use standard sound devices instead of "Doro 212IPC" (you can still keep the Doro settings in Skype). The first thing I noticed that you must manually open the "dial" tab in the Skype client, otherwise you can not dial a phone number. If any other tab than "dial" is selected in the client, the phone's number pad works for navigation up/down/left/right, which e.g. makes it possible to choose a Skype user in the buddy list. But as it's actually a phone, one would expect that when dialing a number from the key pad, the phone puts the Skype client into dial mode by default. As you must visually verify that the Skype client is on "dial" tab, the number pad on the phone is almost useless, as I can as easily type the number in the Skype software client on the computer when I am there anyway checking that the correct tab is open. The other thing I expected to find in the phone was that incoming calls would ring in the phone. But the ring signal is possible only from the computer. How hard would it be to put a small speaker in the phone and activate it on incoming calls? Without this feature, the phone feels like an odd headset. Overall impression of the phone device is positive, specially considering the low price. It's OK for making casual calls, but probably too boring if you are making a lot of calls. As the phone does not have a screen showing the dialed number, you will rather soon happen to dial a wrong number if you do not verify it on the computer screen. Note: you must purchase SkypeOut credits for making outgoing phone calls; and SkypeIn service for accepting incoming phone calls to Skype client. Skype-to-Skype calls are free. 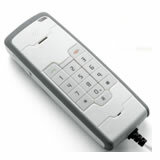 could you send me the driver to Doro 212ipc handset for Xlite because my keypad in handset dosent work in Xlite. ANyone get thi sworking on Vista?